It seems on all my journeys to photograph something new, I inevitably stumble across something, someone who is going to impede my progress. This unknown or unseen force is out there. It is just a matter of time until I need to deal with it. Take for instance, the photo below. This is on the 60 mile never-ending dirt and gravel road to Toroweap, possibly the finest viewpoint along the rim of the Grand Canyon. This road sign clearly states that there is a cattle guard ahead. But to have real cattle guarding the road! I was expecting them to collect a fee from me. I’m just glad I wasn’t on a bicycle. I can’t believe the authorities think someone would ride a bike on this road. Anyways I did wave to mom and presumably her son and they let me pass without incident. I wonder if they’re with the National Park Service? I was in Monument Valley this past spring when I got a flat tire from running over a gigantic metal tent stake. 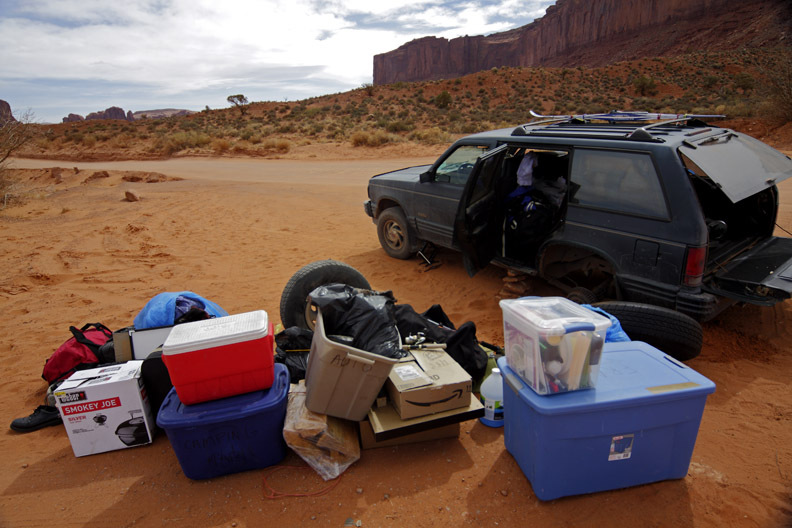 As you can see from the pic below, I had to empty all my gear out of my vehicle to get to the spare and the jack. The jack gave way because the hard-packed dirt I was parked on wasn’t hard enough. You may be able to see some rocks I used to help prop the vehicle back up. Thankfully there are a few rocks in Monument Valley. This really didn’t work but eventually a couple of really nice Navajo gentlemen came by and helped to really prop up my car so I could change the tire. Make sure you always have a spare and I also carry a small air compressor in my vehicle. Doesn’t seem possible all this gear fits. Those are skis on top. Sometimes I drive on roads with no real thought as to where I am going because you never know what you’ll run into. If you are looking for good subjects to photograph, it is best to drive on the country back roads, not I-15. 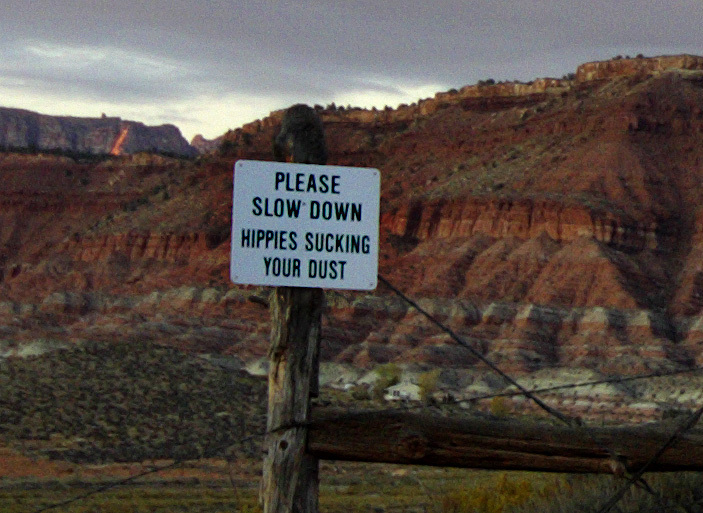 In the photo below, you’ll see the sign I encountered after driving on a badly constructed dirt road near Zion National Park. There was no way I was going to go any further. This guy probably lives in a trailer and is missing some teeth. I’m sure he won’t be reading this blog. I’m sure. The people who left this sign below were much nicer. Hippies are very peaceful and try to be healthy. 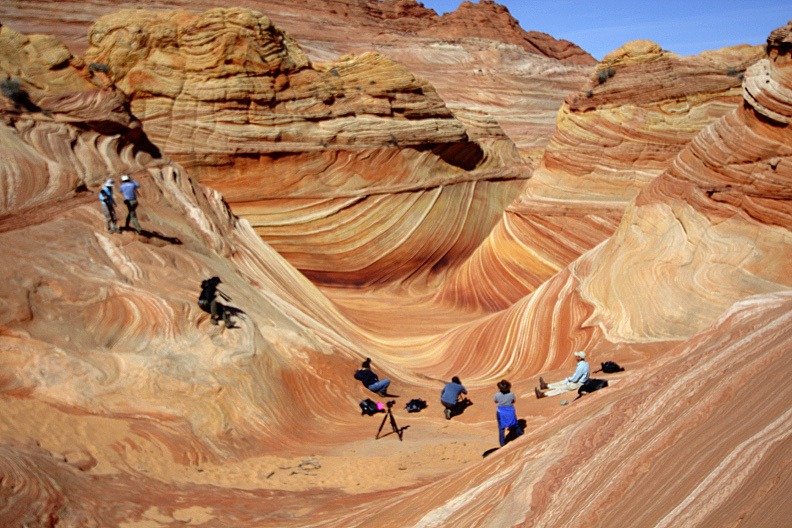 People can get in the way of getting a good photo as witnessed here at The Wave. They only issue 20 passes a day for The Wave but it seems like everyone comes at the same time. I’m going next week if anyone wants to tag along but bring your surfboard and a bottle of SPF 30. Someone has to take the photo and someone has to supervise. 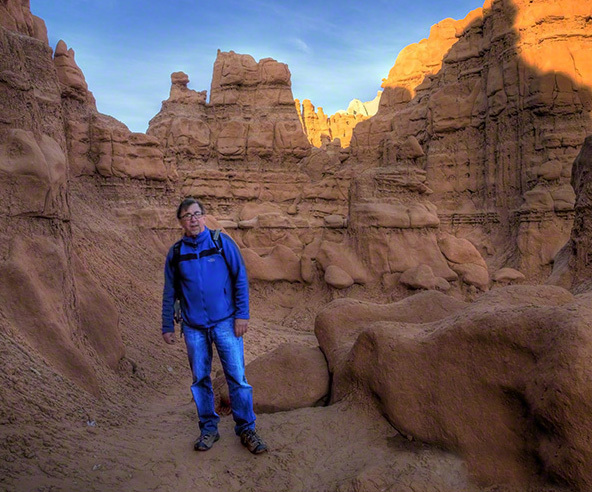 Or the time I was in a hurry and trying to get to Cathedral Valley in time for sunset. This is rural Utah. There are no bypasses or exit ramps. You just have to be patient. 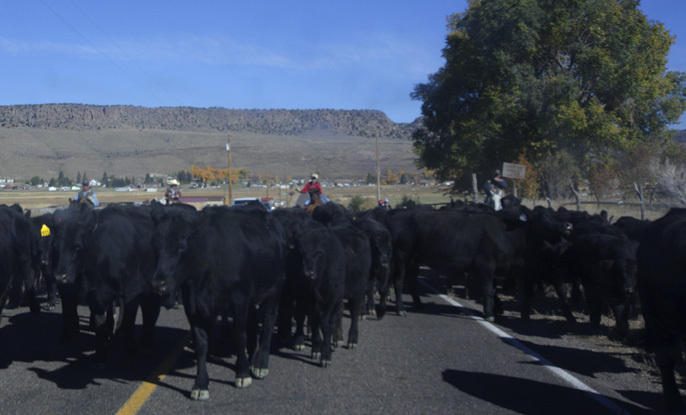 This cattle drive was taking place on the main road just outside the town of Loa. 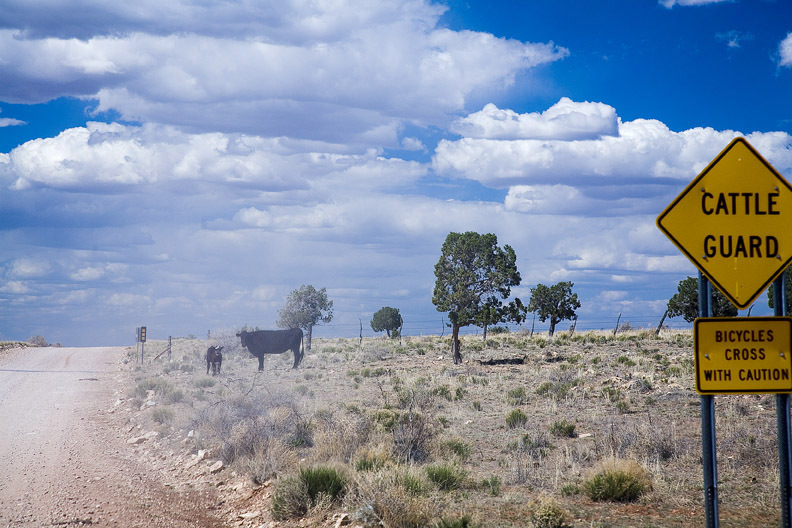 I guess cattle and cowboys have the right-of-way. I only have horsepower. If you look closely, you’ll notice that 3 out of the 4 cowboys aren’t wearing cowboy hats. I guess I better stop. They’re wearing baseball caps! I waited here for about 20 minutes for them to pass. One really good PHOTO TIP. Try to keep your windshield cleaned at all times. Your photos come out much sharper. 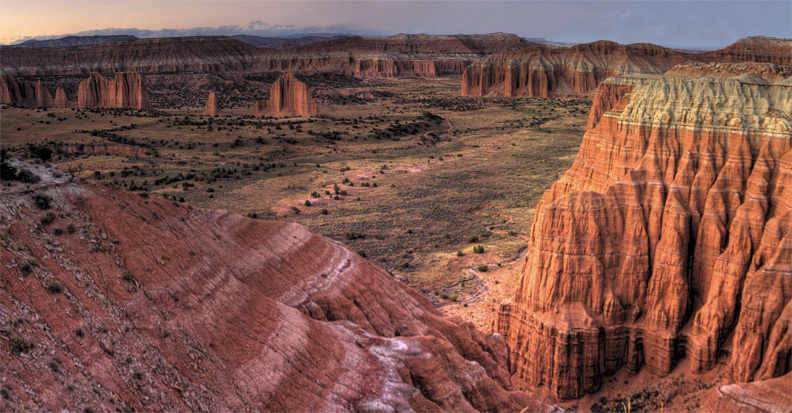 I did finally make it to Cathedral Valley just after sunset and was able to get this shot below. Stay tuned for my next blog on my electrifying trip to the North Rim a few months ago. Pretty humorous, Mike! With the crazy meth-heads, etc. out there, off-roading can yield some serious consequence, take care of yourself!